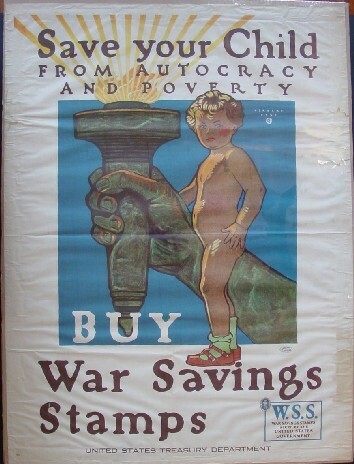 Comments: A great image of a child standing by the hand and torch of the Statue of Liberty delivering the message that by buying War Savings Stamps you can help save children from autocracy and poverty. Rare large format version. Condition: Shrink wrapped, looks like paper tape reinforcing edges on back of poster, some staining through (as shown) could be framed or matted out.